Great things happen when people join forces. Blog Action Day's mission is to unite bloggers and amplify a social message to lead change. You are invited as a blogger to be a part of this great initiative and help build awareness. You might have already heard of Blog Action Day. Every year, during one particular day participating bloggers write about one important global topic, with the objective to generate an amplified global discussion, which resonates and triggers change. 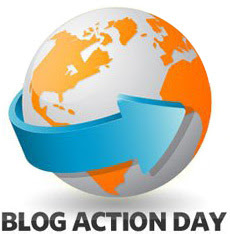 Blog Action Day brings together bloggers from different countries, interests and languages, and you are most welcomed. Past topics have included "Climate Change", Poverty, Food and the "Power of We" with over 4,000 blogs taking part every year. We at BlogUpp are honored to be supporting the action as a partner. Register your blog today. Your support is needed to amplify this year's Blog Action Day theme - the Human Rights, on October 16. Let's leverage the power of many to help improve our society. To get started, a good point to begin with is to watch team's video on Blog Action Day's website, as well as check the Wikipedia article. You are also invited to learn about our own vision, expressed in the interview we had recently with Karina from Blog Action Day. Besides the opportunity to be part of a global team of influencers along with Blog Action Day initiative, it's also worthy to have your blog listed on Participants page. Simply go ahead and get enrolled - it takes just a moment. Thank you in advance.